Rand Rosenthal's passion for plants goes beyond landscaping. Rand Rosenthal’s passion for plants goes beyond landscaping. He loves to create beautiful container combinations melding antiques with plant life to create something new and unique… “marrying the old with the new, inanimate with the living, and objects touched by the hands of time.” Find his innovative fabrications locally at his warehouse behind K.Hall on Manchester Road, Warson Woods Antique Gallery or Treasure Aisles Antique Mall. SLHL: Which came first, landscape design or antique design? Rand: Landscape design came first, but I have always loved working with interesting plant materials. My passion now is working with succulents and tropical plant materials creating outstanding container combinations using those. SLHL: What makes an antique piece catch your eye to work well as a container? Rand: I love working with pieces that are imperfect and weathered with the hands of time. I also love natural objects like driftwood and decayed wooden pieces. Rand: I wouldn’t say I have just one style; there are many. Tuscan. Western. Vintage. Shabby Chic. My style is whatever excites me and inspires me. SLHL: Where do you get your inspiration? 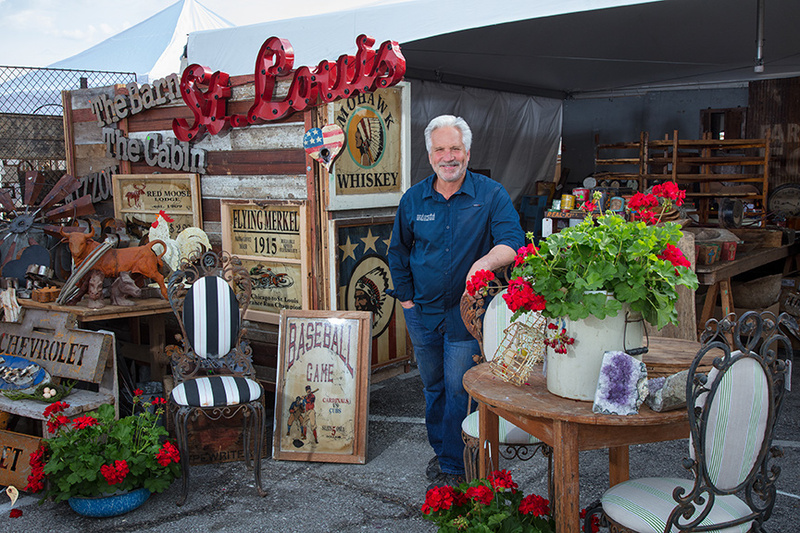 Rand: Antique markets, gift shows and showrooms. I love to travel around the country to look at the way different dealers are decorating their spaces. It inspires me to think about different pieces I can transform. In regard to plant materials, I often travel to southern Florida and handpick my own plants to bring back to St. Louis. I always love to see new and interesting things, whether plants or antique styles. SLHL: What items can be made into a container? Rand: Almost anything that inspires you can be turned into a container. I love to bring vintage items back to life by adding interesting plant materials to them from old chairs to cowboy boots and couches. SLHL: Can a homeowner bring a piece to you to custom design? SLHL: Do you weatherproof the planters for the outdoors? Is there anything a homeowner needs to do to keep a piece from weathering or ruining? Rand: Concrete is weatherproofed by emptying the container in the winter and making sure it fully drains, otherwise they will crack. With any kind of concrete piece, you need to be careful to make sure it doesn’t collect water. For fabric pieces, I spray the material with Rust-Oleum® NeverWet®, which acts like a shield on the fabric to repel water. I use it on chair or couch fabrics, boots, leather, etc.